The shower head is pretty basic in style – nothing earth-shattering there. Actually, this is good, since it mixed in with my existing bathroom fixtures beautifully. I simply removed our old shower head and screwed this one on…easy-peasy! This is a nice, heavy piece of hardware…you can definitely feel the quality of the piece from the time you take it out of the box. I like the larger diameter of the shower head, as it feels much more luxurious than the smaller size we had. Since last fall, I can also say that the finish looks as good as the day we installed it – no corrosion or discoloration of any sort. In our small town, our water and sewer bills are quite high, so saving water any way that we can is essential. With a couple of kids, that can be a challenge sometimes! But, I’ve hesitated to install a traditional “low-flow” shower head because many of them slow the flow of water down to a mere trickle…and, I’d like to be able to rinse my hair in a reasonable amount of time. I can happily endorse this shower head in the water use department! While the spray from the shower head feels heavy and luxurious – much nicer than my former shower head – my water bills have not increased even a little bit! The other feature I love is the rubber gaskets found around each little sprayer hole. Our water has a significant amount of lime in it, leaving me battling with calcium build-up on bath and kitchen fixtures. With these rubber gaskets on the sprayers, I just peel any lime build-up off of the gasket with my fingernail…no more soaking the shower head in vinegar or scrubbing it clean. Love that! I can wholeheartedly recommend this shower head for both my design clients and to you, my readers. 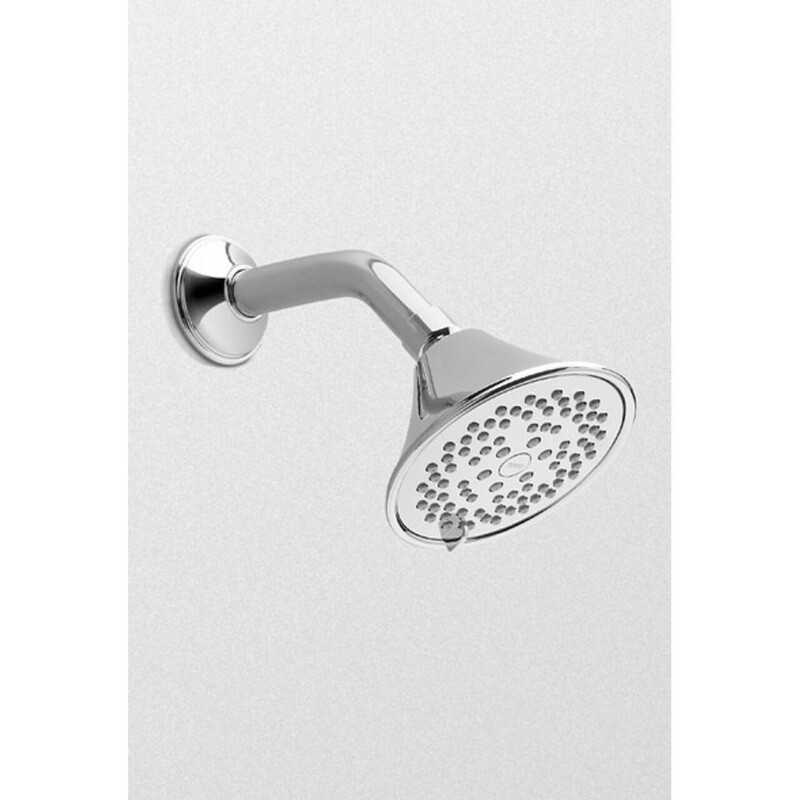 While Toto is a manufacturer of luxury bathroom fixtures – the largest manufacturer, in fact – this shower head is very affordable and a great way to upgrade your shower without breaking the bank. There is no plumber needed for installation, and it takes just a few minutes to install. If you have any questions about this product, feel free to leave them in the comments below and I’m happy to answer them. Give the Toto shower head a try for a quick bathroom upgrade…you won’t be sorry!